The police should do more to reduce anti-social behaviour, a candidate for the West Mercia police and crime commissioner (PCC) has said. Conservative candidate Adrian Blackshaw pledged to do more to "champion youth achievement" if he is elected. He was responding to a caller from during a BBC Hereford and Worcester debate who complained about litter and bad language outside a youth centre. Mr Blackshaw said: "Let's not criticise the youth as an knee jerk reaction." 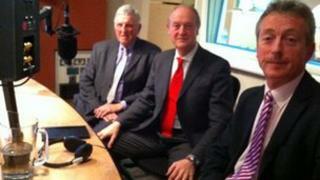 The PCC is due to replace the existing police authorities across England and Wales. After elections on 15 November, the successful candidate in West Mercia, which covers Herefordshire, Worcestershire and Shropshire, will hold the force to account, help establish priorities and set the budget. Mr Blackshaw said: "Anti-social behaviour is a big problem, there were 13,500 incidents in Worcestershire and 14,000 in Herefordshire in the last year alone. "I've met a number of people who work on fantastic social enterprise schemes and I will try to fund some of them from the budget." There are only three days left until the polls open for the elections but you would be forgiven for not knowing that fact. While the advertising campaign has gathered momentum in recent weeks and parts of the media are taking a closer look at the candidates, it's still thought less than 1 in 5 people will head to the ballot box on Thursday. That's a worry. This man, and we do now know it will be a man in West Mercia, will be responsible for fixing the police budget, setting the force's priorities and hiring and firing the chief constable. But will they have a mandate to make those big decisions if most people haven't bothered to take part in the democratic process? He added he would introduce an awards ceremony to improve the perception of young people who "get a bad press". Labour candidate Dr Simon Murphy said more visible policing would help but that youth centre staff should address the issue. He said: "Youth centres themselves are part of the solution to anti-social behaviour which is an enormous problem." Independent candidate Bill Longmore said the police should have a special group of officers who monitor anti-social behaviour in targeted areas on particular nights of the week. He said: "We should be getting young people involved in sport and other meaningful activities and we've got to get the community to join together to get the police to do that. "It's going to take a big effort but we have got to start to do it." Other areas discussed in the debate included improving local policing and tackling the process of recording crime.